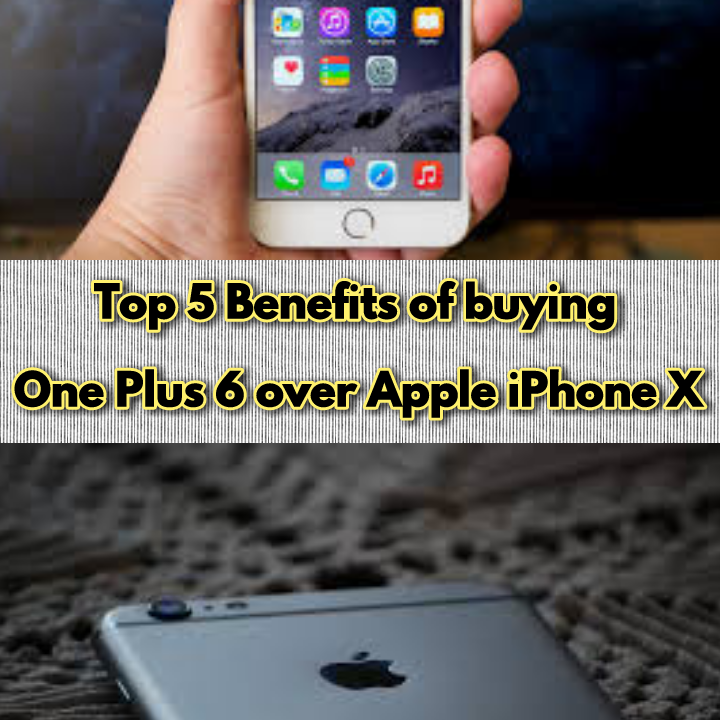 Why to buy One Plus 6 smartphone over Apple iPhone X - Top 5 reasons explained | Benefits of buying One Plus 6 over Apple iPhone X : One Plus 6 smartphone has been launched in the current month of May 2018 with a motive to dominate the entire smartphone industry. The dominance of Chinese smartphone manufacturer has been already proven with the dynamic launch of smartphone handsets with brand names such as Xiaomi Redmi series of phones, Oppo, Vivo etc to name a few. Soon after the launch and grand success of Micromax series of smartphones in the Indian market, the Chinese smartphone manufacturing companies targeted the Indian citizens and went on exporting their big brands in India. 4G VoLTE technology enabled both SIMs simultaneously along with several other features are not a big deal now-a-days. One Plus 6 series of smartphones has also taken charge for the past few years and several updated series are dominating the Indian market by satisfying the youths with their updated series of features in an extremely low price range. The Indian youths and the persons of almost all the age groups use to get attracted towards the smartphone models launched by the Chinese smartphone companies following their fully loaded and featured smartphones in an amazingly low price range as compared to the other already existing smartphones of different companies. The month of May 2018 is the proof of viewing One Plus 6 smartphone as one of the newly titled "Flagship Killer" smartphone built with all the updated set of inbuilt characteristic features including latest processor, high capacity RAM, powerful camera etc to name a few. In order to actually win the race of the flagship killer title, One Plus 6 smartphone must be able to challenge the actual competitors in the race including the Apple iPhone X which is considered one of the biggest challengers of the phone in the race of being a flagship killer. Apple iPhone X launched in the month of September 2017 launched a notch design trend and accordingly announced the set as one of the best iPhone model launched till date. The question of the best smartphone brand yet arises in the eyes of the iPhone lover as well as the One Plus lovers and they often get confused to decide in between the two. If One Plus is better over the iPhone X newly launched model, then why not to choose the One Plus 6 smartphone over Apple iPhone X in a comparatively lower price range. 1. Headphone audio/video jack for better user experience: As compared to the Apple iPhone X, the One Plus 6 smartphone has been launched with an inclusion of headphone audio/video jack for experiencing better music experience. During the launch of One Plus 5T smartphone model, the company has conducted an open poll on the issue to get the user's feedback on inclusion of this worthy feature. Fortunately, most of the music lovers along with other users being habitual of using the headphone jack has put up their favor towards inclusion of this nice feature and following the majority of poll towards including this lovely feature, the company introduced the model along with this headphone jack and the smartphone's popularity boomed all over the world especially in India. On the other hand, Apple iPhone yet use to launch their recent smartphones without any audio/video jack and this most loved feature of including a headphone jack separates the One Plus 6 smartphone with the Apple iPhone X in an exclusively lower price range. 2. DASH charging feature introduced by One Plus 6: Though Apple iPhone X model has been introduced with the Wireless Charging facility, ignoring the issue One Plus company has proudly launched the smartphone by the name One Plus 6 with DASH Charging facility. The charging features in the sense of wireless charging as well as the DASH charging introduced individually with both the smartphones is only for carrying out the purpose of fast mobile charging. But, the the DASH charging facility introduced by the One Plus 6 smartphone is far better, efficient and fast as compared to the Apple iPhone X in multiple senses. The DASH charging facility is also already loaded along with the phone and no any other expenditure is required, however, in the case of Apple iPhone X, a wireless charger needs to be purchased separately along with the phone acting as an extra expenditure in addition to the smartphone. 3. Dual SIM support with One Plus 6 compared to Apple iPhone X: With the launch of Reliance Jio free internet service, most of the users all over the country are habitual to keep two different SIM cards together in their smartphones. Apple iPhone X users however fails in this regard owing to their traditional brand image type feature stating "Yes, Apple will never use two SIMs together". Haa..Haaa, what is this ? It seems nothing and makes the Apple users feel very much disappointed whenever they want to have a free access to the internet based services as well as regular calling type services together in a single smartphone. One Plus 6 smartphone wins the race in this regard also providing the users a facility of accessing dual SIM cards together for using data as well as calling facilities individually. Both SIM even utilizes VoLTE support altogether along with both 4G SIM cards even of Reliance Jio in the case of One Plus 6 smartphones. 4. Phone unlocking features differentiation including Face Recognition and Finger Print Sensor: Talking frankly about both smartphone's unlocking features, the Apple iPhone X remained static with their face recognition and unlocking technology over their smartphone. No doubt the feature seems worthy and trending keeping in view the modern technological advancements in the field of smartphones but simultaneously it would not be wrong to state that merely the face recognition and unlocking technology often use to fail promptly on several individual situations. Users often get disappointed whenever their smartphone unable to get unlocked while wearing sunglasses, caps or even in the humid, cloudy or low lighted weather. It is therefore required to have a fingerprint sensor technology also installed in the smartphones to quickly unlock the phone without any further unlocking issues. One Plus 6 proudly states the presence of both the unlocking features including fingerprint sensor as well as face recognition system too in their smartphone model which can proudly be utilized as per the user's desire. 5. Comparing the price range of both the smartphones: It has been a trend of not comparing the Apple smartphone model price with the other already existing branded and fully loaded smartphones in the market. But why not? If One Plus 6 is proving much more facility and far better user experience than than the Apple iPhone X model, then the price range of both the smartphone models also must be compared. It is for the information that the One Plus 6 smartphone with 64 GB storage capacity and 6 GB RAM has been launched at a retailing price of Rs.34,999 only, however, the Apple iPhone X with almost similar or even the lesser set of features makes a difference of Rs.50,000 in India and has been successfully selling their smartphones at a retailed price of Rs.84,990. This is one of the comparison with all the discussed set of specifications in terms of processing capability as well as the storage capacity. However, if someone wants a much more faster RAM along with much more storage capacity, then the One Plus 6 smartphone is also available with 8 GB of RAM and 256 GB storage capacity and is proudly available for sale in Rs.44,999. However, the similar set of features with Apple iPhone X go beyond the thousand's limit and touches the figure of six digit in a country like India.